Sales Funnels, Sales Tools, and VR – Prestige Vision Inc. Your Customers Expect the Best. So Do Ours! Start by clicking the “Schedule Consultation” button and you’ll be able to schedule a FREE 1:1 discovery session. Once on the call, you and a team member will be able to determine if we are a good fit. Then we can move on to the process of customizing a report to help you implement the most performing strategies to help you sell in today’s market. Once we put in place all your systems, funnels, and tools. You are now generating qualified leads that are converting into sales for your business. 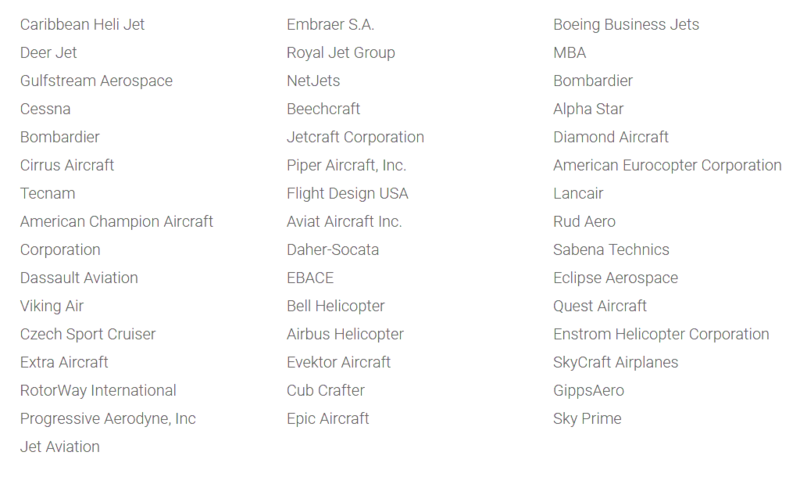 Over the years we have worked with over 400 of the largest aircraft and marine manufacturers worldwide. We are proud to consistently deliver outstanding services that yield results for each one of our clients. "I've worked with Vincent and his team at Prestige Vision Inc. for many years now and have always liked their innovative approach...His team built us a complete landing page and set it up very quickly. The email sequence was very effective and I was receiving new leads every day. We ran the campaign for 90 days and received over 200 leads. Overall, we invested just over 5k all included and ended up selling a new yacht worth $720,000 which was a fantastic ROI for this short campaign!...I would definitely recommend their services." "I have been in my role at Sabre Yachts for almost 20 years now and before that I worked for Beneteau for another 10. In my 30 years in this business I have never received more prompt, courteous, accurate and complete service from any marketing supplier." "Fleming Yachts enjoy working with Prestige Vision Inc, who operate in a very professional manner. We particularly like the fact that we can leave you to carry out a project without needing constant input and suggestions from us, you know what is needed and you make it happen." "I am proud to announce we have the Prestige Vision VR walkthrough up and running on our web site. Thanks to the total team effort and support from everyone from Maritimo, we were able to transform 550-03 into a gem that sold to the first customer that looked at it. These are valuable sales tools so please use them when ever you can! Check it out! Go to the 550 section and to the walkthrough." We’ve generated 12,653+ qualified leads that have resulted in dozens of millions of dollars in sales. It is absolutely critical that you schedule a consultation today if you want to work with us in May/June. That’s our current waiting list, so don’t wait until the last minute. It is absolutely critical that you schedule a consultation today if you want to work with us in April/May. That’s our current waiting list, so don’t wait until the last minute.